I really wanted to share this article with my leftist friends, but I noticed that the graphs compare 2015 4th quarter with 2016 3rd quarter. Since the 4th quarter is Christmas, we would expect the employment rates to be higher than 3rd quarter. I would prefer to see the same quarter in each year compared. The key issue in this debate is whether or not markets can be engineered, to achieve specific social outcomes The answer is clearly NO. Markets are designed to deal with constraints. When those constraints are politically imposed, surplus or scarcity occurs. In the minimum wage case, there is a surplus of unneeded labor at the imposed price. There is a scarcity related to work that cannot be performed economically. The unneeded labor will become a burden to society, while cleaning, landscaping, and caretaker functions among others are performed less frequently or not at all. Not the outcomes anticipated by the legislation. The well off in society will hardly notice the difference, but those at the bottom will face a drearier existence, imposed by the very politicians they automatically re-elect. 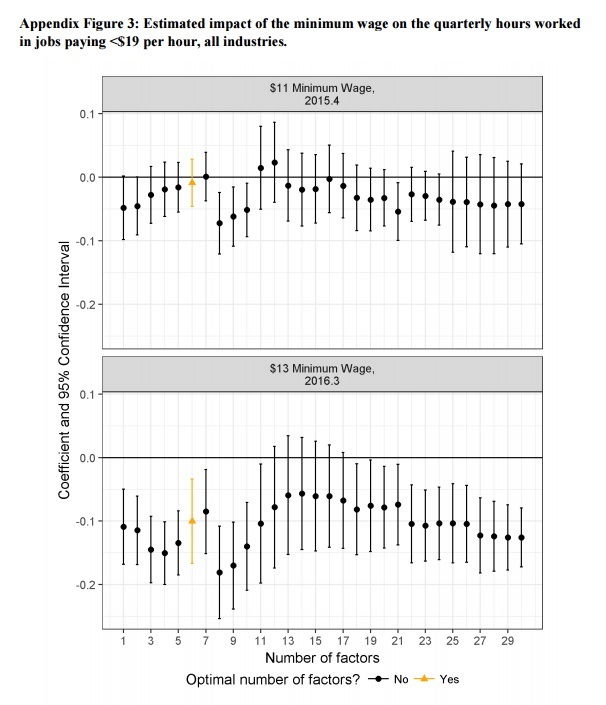 Intuitively, claiming that lowering minimum wage leads to less aggregate pay for low income workers is like claiming that tax cuts pay for themselves. It rarely happens. But there are other costs to this economic distortion, for example everyone else has to pay more for goods and services, which, all else being equal, makes for a less competitive and less efficient economy, and price signaling is suppressed. All summed up minimum wages are a pricing distortion that decrease economic efficiency and contribute to overall systemic societal decline. 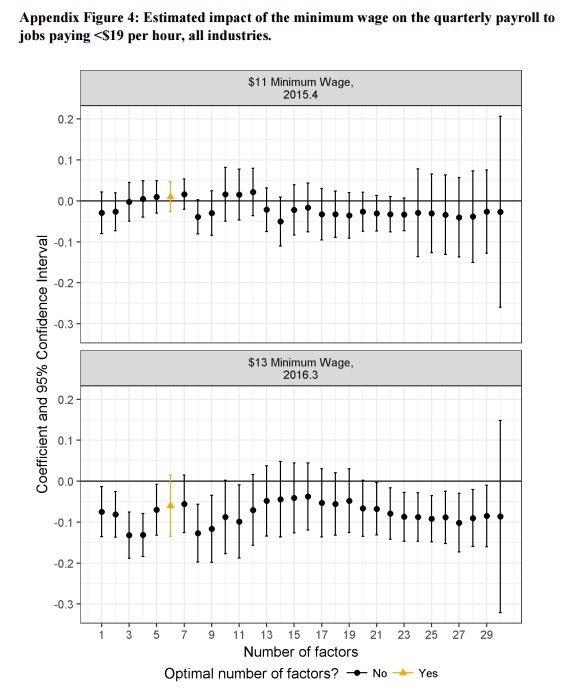 In practice, minimum wage earners, or people who think that one day may be either temporarily or permanently become minimum wage earners are a sizable voting block. But they’re typically not the most intelligent people I’m afraid to say. So they’re easy to manipulate politically. Add to that some smarter useful idiots and self righteous intellectuals who don’t understand economic efficiency and its effect on world competitiveness and long term decline — and you have a majority. Sometimes reality is just ugly. Any lefty who likes this argument should agree as follows. Any family making more than 4 times the median income ($120K) should be “enslaved in place”. All income above that level will be confiscated and given to those making median or below. Penalties will apply to anyone who reduces his/her income without good cause. Only about 15% of households have that income or more, so this would undoubtedly be for the greater good. Uh, thinking about it, that is what most lefties want right now, just not the higher earning ones. My message to higher-income lefties: You are selfish wreckers who are denying your aid to the greater good of your country. You won the brains lottery, and are now going to give back your undeserved winnings. 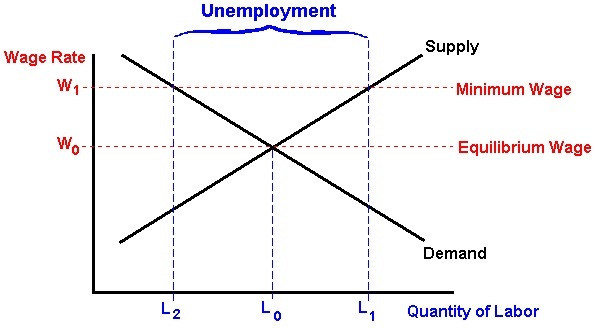 If higher aggregate demand were actually good, we could accomplish it easily by printing money and handing it out. Say 10% of your income above median and 20% below median. This has been tried many times, and currently in Zimbabwe and Venezuela. It hasn’t been tried in the exact fashion above, but close enough. The result has been poor, causing rapidly increasing prices and reduced production. However, all lefties are confident that the governments involved could produce prosperity by jailing or shooting the vast number of wreckers who control the means of production and distribution. All will be well after scientific, efficient, state control is imposed. Keynesian economics: Money is a social construct. We print all we need in the back room. If everyone had more money, then everyone would be rich.